Promotional Logo Miami Visor Sunglasses are presented in a good list of attractive color options. These custom sport sunglasses have a dimension of 6" H X 2.5" W and their adjustable visor makes them a unique and convenient option for pool side events and back yard events. UV400 protective lenses make them efficient by providing great protection from the harmful UV rays. Along with the default imprint area of 1.50" H x 2.50" W in the visor, you can also make use of the 0.38" H x 1.50" W imprint space on the arms for best outcomes. Order these custom products right now to earn free online proofs, free artwork design and lowest price guaranteed offers. 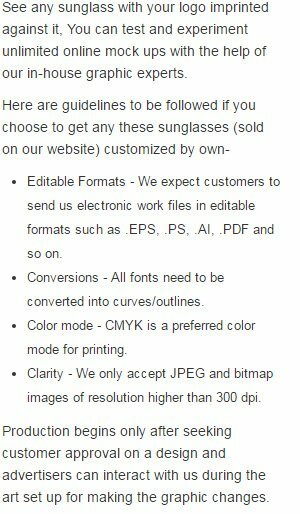 Request a quote to know wholesale savings for these Promotional Logo Miami Visor Sunglasses. When ordering blank items of this product either exactly 1 or atleast '+75+' must be ordered!